Finding the mark to be primarily geographically deceptively misdescriptive, the Board affirmed a Section 2(e)(3) refusal to register the mark MOSKOVSKAYA for vodka. The crucial issue involved the doctrine of foreign equivalents, and more specifically, the definition of the "ordinary American purchaser." In re Spirits Int'l N.V., 86 USPQ2d 1078 (TTAB 2008) [precedential], vacated and remanded, Appeal No. 08-1369 (Fed. Cir. April 29, 2009) [precedential]. [TTABlogged here]. 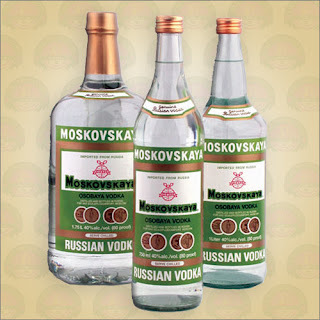 Applicant admitted that the goods will not originate in Moscow, and there was no dispute that MOSKOVSKAYA means "of or from Moscow" or that Moscow is known for its production of vodka. Applicant maintained, however, that the primary meaning of MOSKOVSKAYA is not geographic because the average American purchaser would not translate the mark into English. Examining Attorney Geoffrey Fosdick, on the other hand, contended that "under the doctrine of foreign equivalents, the ordinary American purchaser, which as stated in In re Thomas, 79 USPQ2d 1021, 1024 (TTAB 2006) refers to the 'ordinary American purchaser who is knowledgeable in the foreign language,' will translate the mark into its English equivalent." Applicant, based on its reading of Palm Bay Imports, Inc. v. Veuve Clicquot Ponsardin Maison Fondee En 1772, 73 USPQ2d 1689 (Fed. Cir. 2005), asserted that the PTO had misapplied the doctrine of foreign equivalents because it had misinterpreted the CAFC's ruling in Palm Bay. "Applicant argues that the Board's decision in Thomas is inconsistent with the holding in Palm Bay 'to the extent that the Board interpreted the Court's reference to the "ordinary American purchaser" to mean "the ordinary American purchaser who is knowledgeable in the foreign language,"' and that the Thomas case along with the authorities cited for this proposition 'are no longer good law.'" Applicant submitted survey evidence to show that "the meaning of the mark is arbitrary because the term would not be translated into English by consumers, and that its geographic meaning would be lost on the public." The Board strenuously disagreed with Applicant's interpretation of Palm Bay, asserting that Applicant had taken the CAFC's reference to the "ordinary American purchaser" out of context and that the CAFC in fact "did not address the definition of the 'ordinary American purchaser.'" "Furthermore, the Court at no point said, or even suggested, that in determining the registrability of a mark in a foreign language, the 'ordinary American purchaser' who speaks or understands the foreign language can, in effect, be ignored. Applicant argues that the Thomas decision 'cannot be squared' with the Court's holding in Palm Bay. The fact is, however, that applicant's position 'cannot be squared' with the underlying principles of the Trademark Act." According to the Board, Applicant's position would undermine the purpose of 2(e)(3) by permitting registration of foreign terms that have the potential to deceive an appreciable segment of relevant consumers. In addition, such a view would conflict with long established case law. The Board presumed that "a word in one of the common, modern languages of the world will be spoken or understood by an appreciable number of U.S. consumers for the product or service at issue." Russian is a common, modern language. The question then is, according to Palm Bay, whether those who understand the language "will stop and translate the word into its English equivalent." That, in turn, depends on the fact of the case. "While there are exceptions to the rule, and circumstances where translation is unlikely, none of those circumstances exist here." "There is nothing in the record to indicate the mark would not be translated because of marketplace circumstances or the commercial setting in which it is used." [TTAB query: are particular marketplace circumstance even relevant in an ex parte appeal?] Nor is there any question of the translated meaning of MOSKOVSKAYA. Therefore, the Board applied the doctrine and found the primary meaning of MOSKOVSKAYA to be geographic. The evidence further showed that Moscow is known for vodka and that purchasers are likely to be deceived into believing that Applicant's vodka comes from Moscow. Looking at Applicant's survey, the TTAB had a number of problems. The survey expert did not screen for consumers who are knowledgeable in the Russian language, and so there is "no way of knowing whether the views of this significant subset of potential purchasers was properly represented in the survey because Dr. Wind made no effort to include them." Therefore the survey results are not probative. Moreover, even assuming that the survey universe were proper, the survey was still "not persuasive or probative of any issue in this case." Applicant "did not even test for whether the mark would be translated." And the Board disagreed with the interpretation of the results [that only 2.6 percent of respondents believe that MOSKOVSKAYA vodka is made in Moscow]. In any case, a mall survey is entitled to limited probative weight because "it is not based on a random sample and the results cannot be projected to the entire universe of relevant purchasers." And the survey's question that purportedly tested for materiality was also improperly designed. The Board concluded that Applicant had failed to overcome the PTO's prima facie showing, and so the refusal was affirmed. TTABlog comment: I, too, was confused by Palm Bay, as I stated several times. (e.g., here and here). The CAFC's handling of the equivalents issue was more confusing than enlightening. But if the CAFC meant what the TTAB now says it meant, i.e., that the relevant purchaser is the average American consumer who is knowledgeable in the foreign language, why did the CAFC agree that "VEUVE ROYALE" would not be translated into English? It didn't give any reasons. It didn't say whether the TTAB applied the wrong test or simply got the wrong result. Moreover, this whole idea of "stop and translate" is troublesome to me. If someone is knowledgeable in the foreign language, would he or she translate the phrase into English at all? Wouldn't he or she just recognize the meaning without making any translation? Update: On April 8, 2008, this decision was appealed to the CAFC.